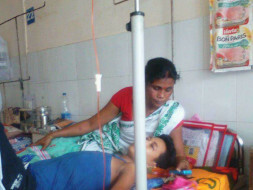 One 14 years old boy from Bijulighat, Nalbari has been suffering from cancer. 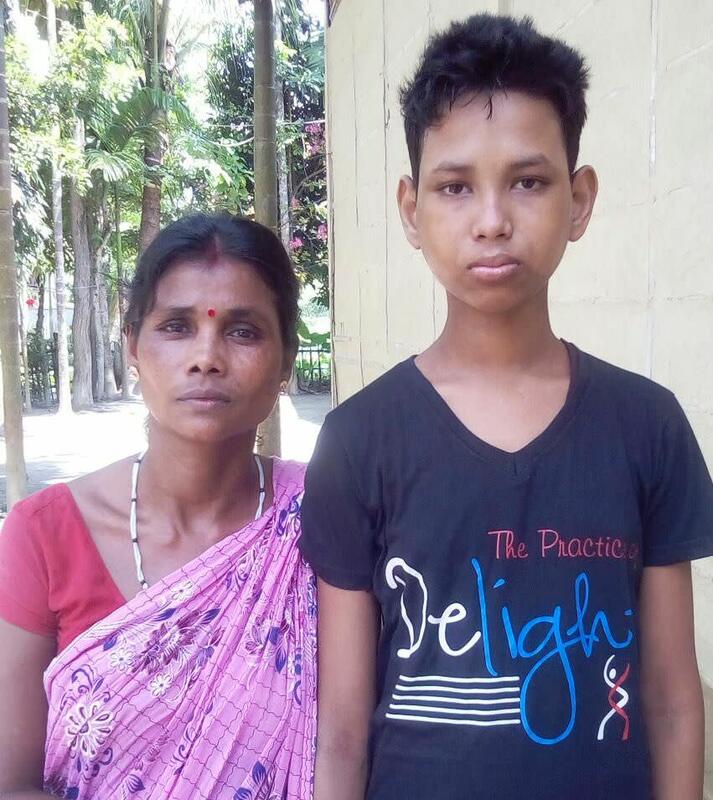 His name is Chandan Das and he belongs to a below poverty line family. His father is a daily wage earner from hotel and mother mid-day meal cook. 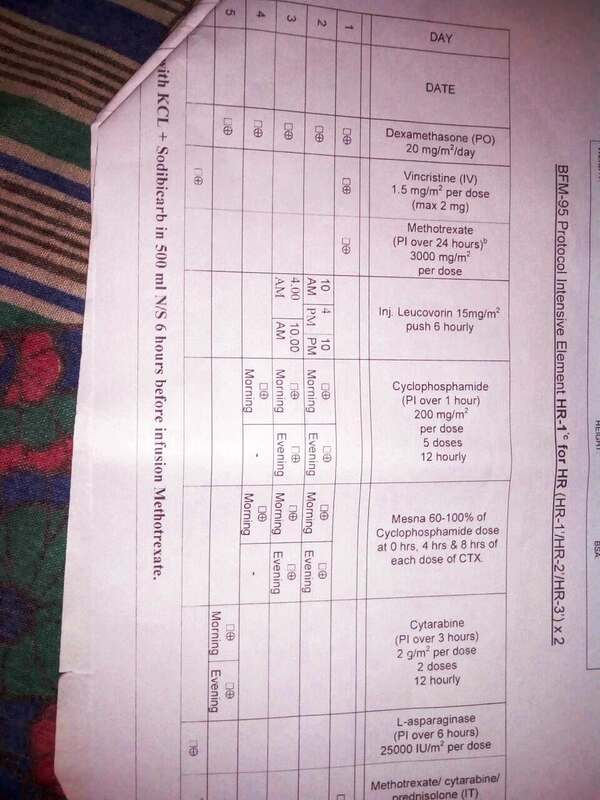 He was detected blood cancer with in 2013 and thereafter completed chemotherapy and medication, he was alright. But his health deteriorated from May'2017 again. 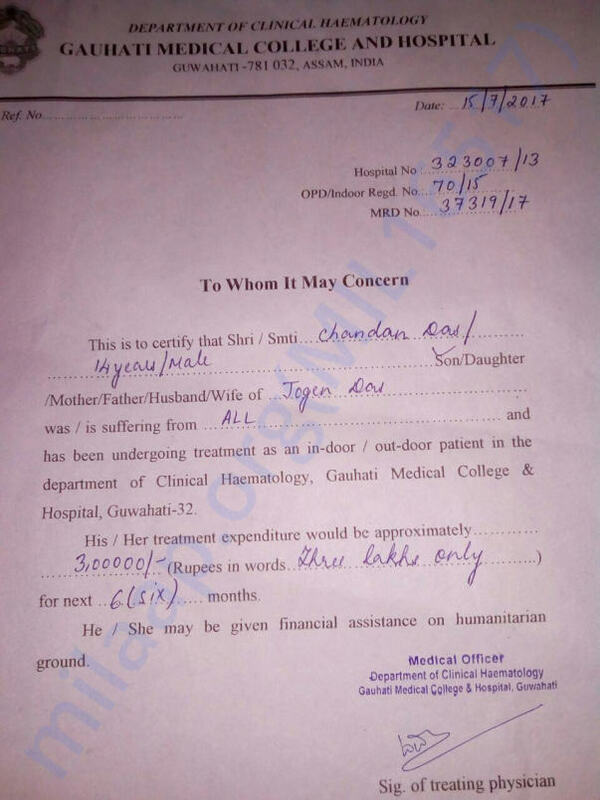 I am helping him in his treatment from 2013. 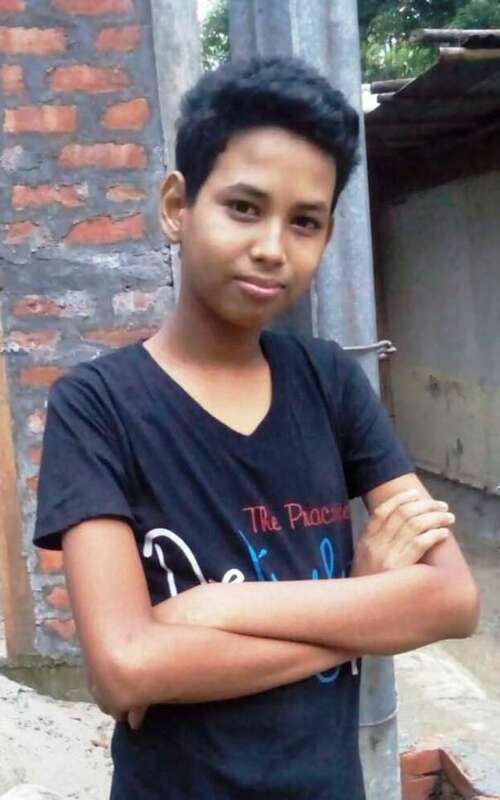 Now, I am not strong financially, but I feel that the treatment must continue and he should get the chance to live. 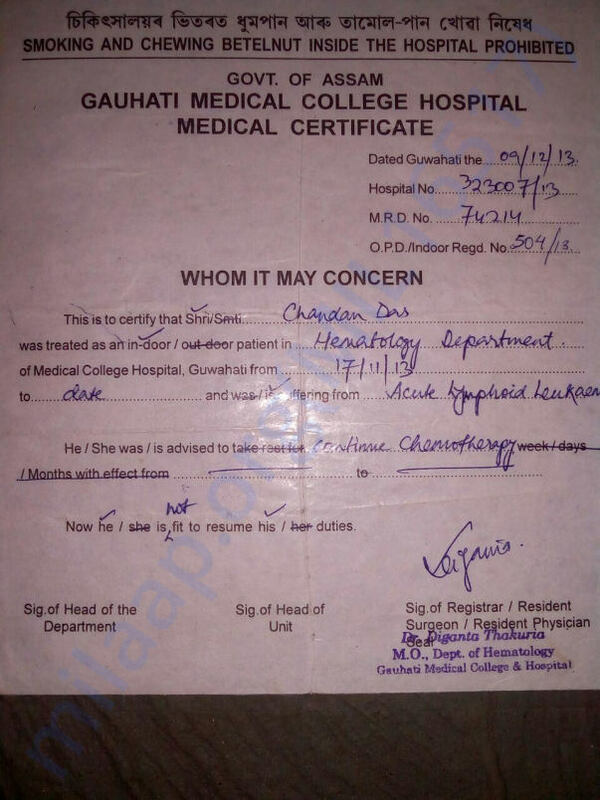 Chandan’s Das health condition is very grim. 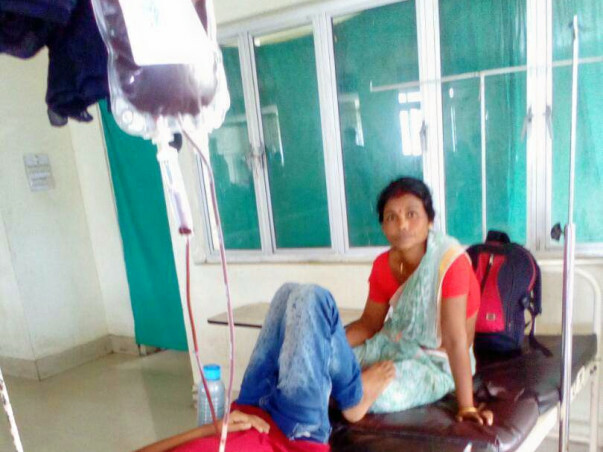 He is relapsing continuously even after continuous medication and infusing of Blood. He has undergone MRI and is found that haemorrhage. Every day various clinical tests are being carried out such as X-ray, Ultrasound etc. 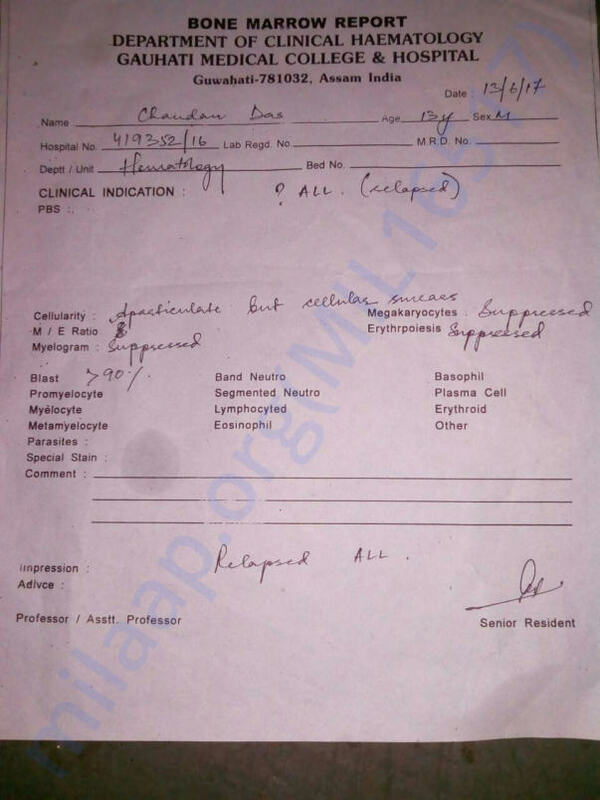 Due to his financial condition Chandan’s family is not able to carry out the necessary tests and medication. They are borrowing from others to carry out the various tests, but this is not enough. Milaap is helping Chandan in arranging money at least some amount. It was possible first time to withdraw certain portion of the deposited money into Chandan’s Account. But of late I failed to transfer the remaining amount to his account due to the requirement of PAN Card and Aadhar Card of Chandan. Even in this life and death situation it is becoming impossible to transfer the money due to this bottleneck. 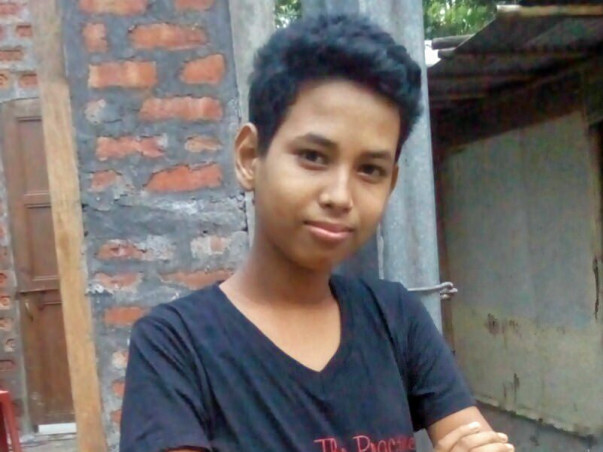 Chandan is a minor (below 18 years) and he is not eligible for PAN card. Aadhar card is yet to be implemented in Assam. He has a joint account with mother from the beginning and whatever money comes it was transferred in this account. As they are below poverty line citizen and unaware of the PAN card due to lack of education and awareness his mother also doesn’t possess the PAN card too. In this complex technical situation your contribution is not reaching to Chandan at the time of requirement. To overcome this bottleneck, I want to appeal to you all to allow me to withdraw the left over money into my personal account as I posses my PAN number and after that I will hand over the entire amount to Chandan. After handover the money I will provide requisite evidence to the platform. Chandan is not my relative and I didn’t know him till I saw an advertisement in a local newspaper about his disease and his financial situation. The journey I had embarked in the year 2013 to support him mentally, emotionally, financially I would like to continue even in my personal difficulties to give a logical end. I want to have your extended hand in this issue raising above all if’s and buts in the definition of TRUST and TRANSPARENCY. Need your support at this crucial time of Chandan’s Life. 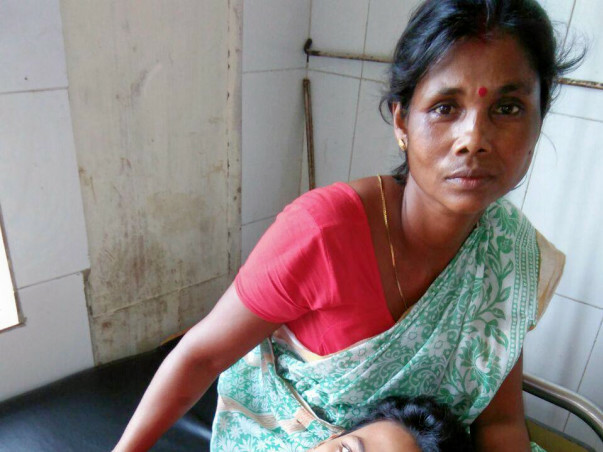 Chandan has just completed his fourth high dose chemotherapy. His condition is not too well as he has developed neck nodes which may also be a relapse or may be infected (work up reports are awaited). His blood counts have also reduced and he is having nasal bleeding. He is being administered treatment for the same. Thank you for all the support you have shown Chandan. Would request you to please share this campaign further with your friends and family and help us in raising funds for his treatment. Chandan has completed 3rd protocol .